We use CNC milling and turning machines to meet our customer’s requirements. Whether it is high volumes being regulated by a customer’s schedule or a single precision CNC component, We can offer the solution. From your initial inquiry we are geared to customer satisfaction. From a high profile military application to a simplest of CNC components for quality and service. 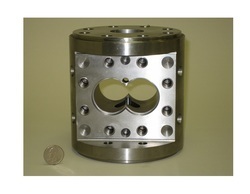 Overall Part Dimensions: As per customer drawings. Looking for Hydraulic Manifolds ?